I think weather wise things are a little confused in the UK at the moment. We're now approaching the half-way point of September, so we're moving into autumn and the leaves are falling from the trees at a rate of knots. Despite this the weather is staying warm and the weather people have predicted that we're going to have an Indian summer. I wasn't actually sure what an 'Indian summer' means, but after consulting my friend Google I've discovered this means a heat wave that occurs in autumn, so that makes perfect sense! In fact, they've said it will actually stay warm until November. I'm kinda hoping this won't be the case as I don't fancy watching fireworks in just a jacket, it's just not right! Even if it's going to stay warm for another month and a half this hasn't stopped me being desperate to start painting my nails dark autumnal shades and I'm now also starting to crave darker lip shades as well. This weekend I decided to go through my lip stash in search of suitable shades. I thought I only had one or two darker shades but I actually have quite a few. This isn't quite all of them, I do have a few more, but I didn't want to include them all so I've picked a selection that I'll be embracing over the next few weeks. I'd previously avoided matte lip products as my lips are naturally dry, but I decided to try the Revlon Colorburst Matte balm in Standout after reading reviews that said the formula was really easy to use and not at all drying. This is a deep red that is really soft to apply and has a minty scent that I know some people aren't keen on but I quite like it. 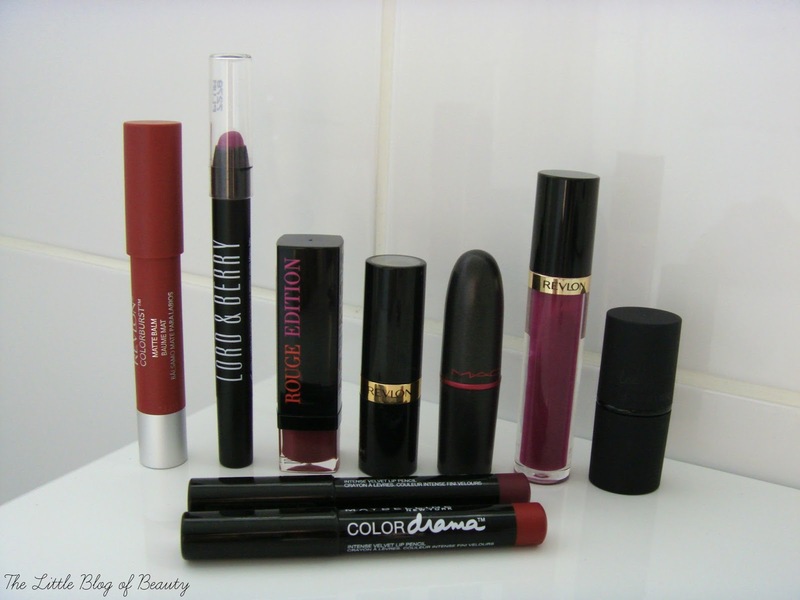 Next is one of my favourite lip products for this time of year and that's the Lord & Berry lipstick crayon in Plum. The name kind of says it all in terms of the shade of this one, as is the case with several of the products I've included. I've spoken about this recently so I won't say much here apart from that I love this crayon. Next is a lipstick that I'm actually not very keen on and that's the Bourjois Rouge Edition lipstick in Violine Strass. This is quite a light plum shade, not quite as sheer as it appears in the swatch, but I'm not keen on this lipstick containing glitter and I also find the formula a little dry, although it's not a matte product. The Revlon Super Lustrous lipstick in Black Cherry looks really dark in the bullet but isn't quite as dark when applied to the lips. I'm not entirely sure where this one came from (I think it may have been a Facebook competition) and I haven't actually tried it yet but I will be giving it a try very soon. The MAC Viva Glam l was a blog giveaway prize. I decided to try a MAC matte formula and unfortunately it is a little too dry for my lips. What I do to try and make this a little more comfortable to wear is a little balm underneath and then I apply Revlon Super Lustrous gloss in Berry Allure over the top. That's the only reason why I've included this gloss in my line-up as I'm not a gloss person and don't tend to wear them. Next up is another lipstick I haven't actually worn yet and that's the Sleek True Colour lipstick in Cherry. This lipstick is super soft to apply but my concern is that it might be too dark for pale complexion, although this is lighter than Revlon's Black Cherry, so that one may well be too dark for me as well. Finally I have the Maybelline Color Drama crayons in Berry Much and Red Essential. Again I haven't tried these yet but that's because I've only had them for about three days now. These are brand new out and as they're just £4.99 each I thought I'd give a couple a try and picked what I thought would be my two perfect autumn lip shades. Obviously I'll pop a review up after I've had a chance to give these a try. What are your favourite lip shades for autumn/winter? 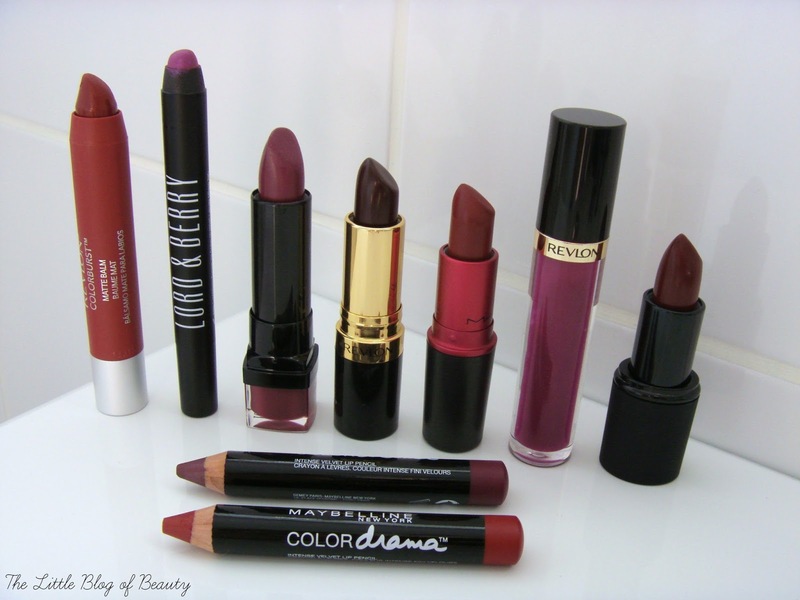 I need to go and get those maybelline colour drama crayons, such perfect autumn shades! I really hope we don't have an Indian summer - I want some snow!! 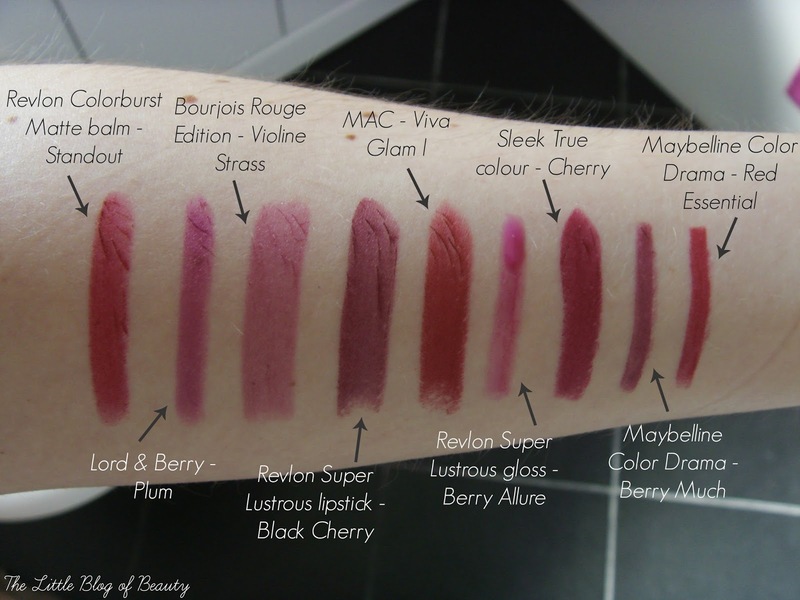 I'm always really wary of berry shades as they can make me look even paler than usual, but some of these look lovely! I could be tempted for the Bourjois Rouge Edition in Violine Strass though, it's very pretty and not too dark. Black Cherry is one of my Autumn favourites, you should definitely try it out soon! I think I need to pick up a couple of the Maybelline pencils soon, it looks like there's some lovely shades!